For a change I cycled this section of the route in the other direction, as part of a longer ride. The signage was mostly ok, though I did have to replace two missing signs, caused by the posts they’d been attached to having been replaced or removed. 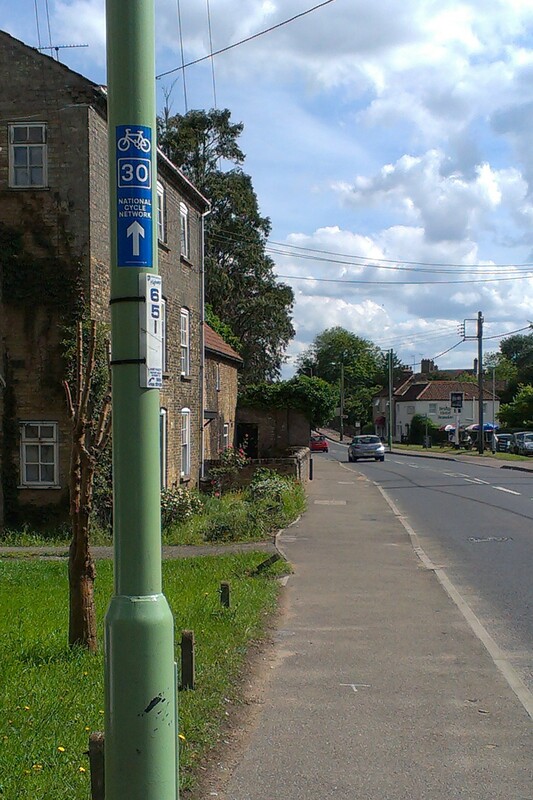 First a sign on the C38 coming in to in Weeting, and secondly, a lamp post in Brandon. Also, cycling in the other direction, I did notice a couple of points where some additional signs would be useful — first at the bottom of Croxton Road in Thetford to direct cyclists to use the crossing on the right to cross London Road, and secondly along Green Lane in Thetford to give riders the confidence to ignore the “no through road” sign. I’ll look in to addressing these issues shortly. Back in February, British Cycling launched their cycling manifesto Time to #ChooseCycling, with a ten-point plan of high-level measures to improve cycling in the UK. In the last couple of weeks, the CTC, Cyclenation and Sustrans have all launched new guides showing how to develop cycle-friendly infrastructure. The three guides overlap to some degree, but are also complementary and aimed at slightly different audiences. They’re all worth a read. As part of a longer ride, I checked most of the section of Regional Route 30 from Diss to Thetford. The existing signs were pretty much all fine, but I did note a few places where an additional confirmation sign would be useful. In particular, an additional sign would be useful when approaching Crackthorn Corner from the east, a sign on the western approach to the B1113 crossing is obscured by a residential hedge, and an additional pair of signs would be useful at the Thelnetham cross roads. 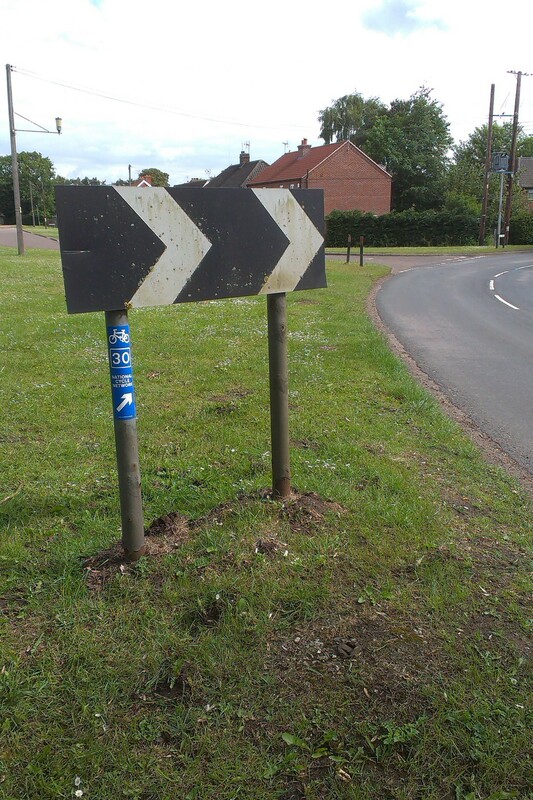 As previously noted, we could do with some additional confirmation signs along the C148 between Bridgham and Thetford, but there are no suitable poles or posts to attach them to there.